Mangoes are one of my favorite fruits. They are plentiful in the stores around here in April and May, so King-Man and I have been eating them pretty much daily. Just as we eat grapefruit with reckless abandon when it is in season (see my previous post explaining How to Peel and Section Grapefruit), mangoes take center stage this time of year. Love them. I like to buy a bunch of them and cut several at a time to have on hand in the fridge for a quick snack or dessert. 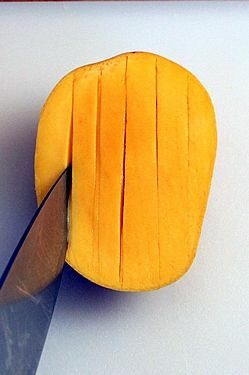 Mangoes can be a challenge to cut. If you try to cut them like other fruits, you're likely to end up with a big pile of mush trying to remove the flesh from the seed. It's not hard once you understand the size and position of the seed inside. 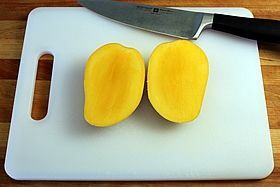 The photos below will walk you through a simple procedure for cutting mangoes that you can quickly master. 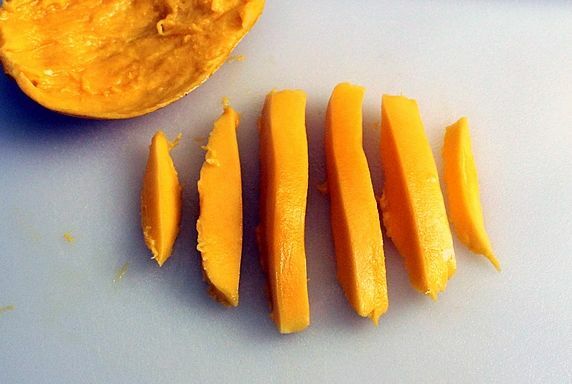 "The King of Fruit" - In addition to being delicious, mangoes are insanely good for you. They are high in fiber and antioxidants and are rich in Vitamin A, C, E, B6 and potassium. They have been found to protect against colon, breast, leukemia and prostate cancers and promote heart health and lower blood pressure. Click here to read additional health benefits and information. 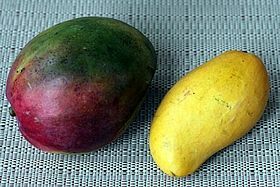 There are a number of varieties of mangoes. Below are the two varieties that are most common in my St. Louis grocery stores. The smaller, golden colored Champagne mangoes are my favorite; but they're both good. 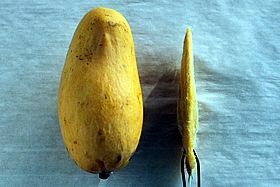 If you've never tried to peel and cut a mango before, it's important to understand the shape and location of the seed before you begin. It has a unique anatomy. Once you understand it, this cutting technique is a snap. 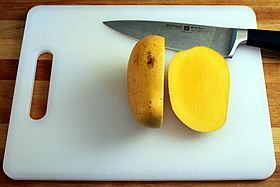 Mangoes can be round or oblong. They have a slightly flattened shape. The seed in the center has a thin, flat oblong shape. 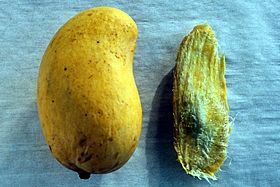 Here's a mango next to the flat, thin mango seed that is inside. 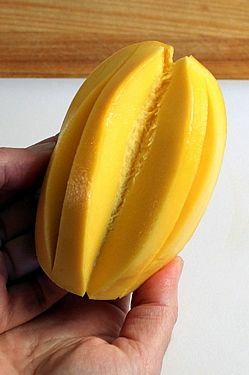 Before beginning to cut a mango, you need to estimate the location of the flat seed in the center. This gets easier after you've cut your first one. Below is how the mangoes look from the outside. 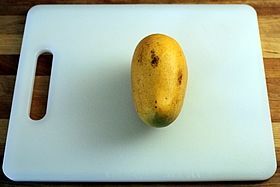 Place mango on cutting board with seed positioned vertically. Slice through the mango approx. 1/4" inch right of the center. This slice should be down the right side of the flat seed, as close to it as possible. 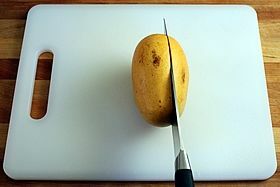 If you start to slice and hit the seed with your knife, move the knife slightly to the right until you are able to slice all the way through. You should have one piece of seedless fruit cut from the right side. Slice down the left side of the seed in the same way. Now you have a left and right fruit slice and a seed in the center. 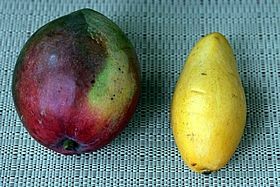 You can try to cut off some of the remaining fruit around the seed, but there's often not much left there--the amount varies with different mango varieties. 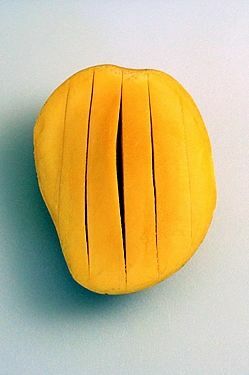 Most of the edible mango fruit is in the 2 larges slices. Discard the center section that contains the seed. Using a sharp pointed knife, cut vertical slices through the flesh of the fruit, being careful not to cut through the skin. My slices are approx. 1/2" wide, but you can make them any width you want. 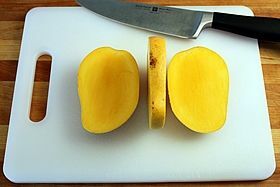 Pull down the sides of the peel, and push up from the bottom to fan out the cut mango. Use your thumbs to pry the slices from the peel. You can also cut the slices off with a knife, or pry them off with a spoon. I prefer the thumb technique--it's easy and it's better at removing the most fruit from the peel. Voila! Mango slices, ready for eating or cooking. I usually cube my mangoes for easy eating and mixing in fruit salads. This is just like cutting slices, but with one more simple cutting step. 1st cut the vertical slices, cutting the fruit without piercing the skin. Then make horizontal cuts to achieve a checkerboard pattern. 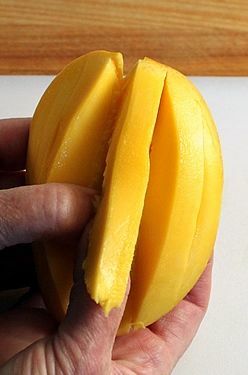 Pull down the sides and push up from the bottom to fan the cut mango. The cubes pop up and separate. 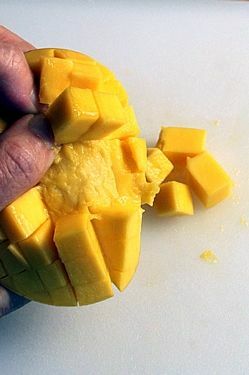 Use your thumbs to pry off the mango cubes (or use a knife or spoon). Voila! Mango cubes, ready for eating. 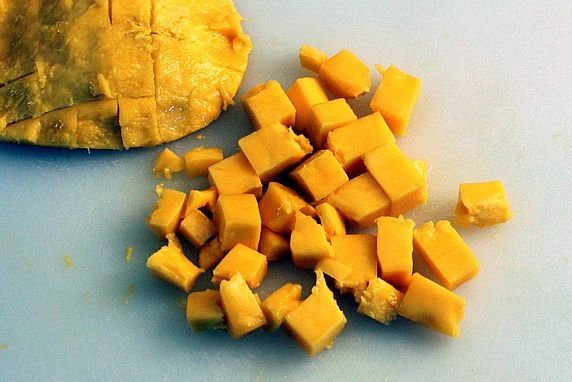 There are many ways to eat mangoes. Here are some simple ideas. #1: Eat mangoes plain. A bowl of freshly cut mangoes is sweet, juicy and delicious all by itself. This is the way we eat them most of the time. 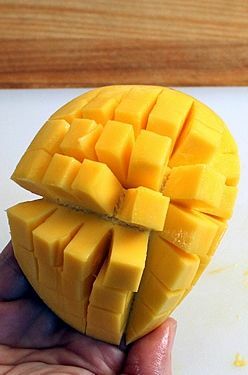 Cube several mangoes at one time, cover and refrigerate them, and you've got a yummy, delicious snack ready-to-eat. They will keep for 1-2 days in the fridge. #2. 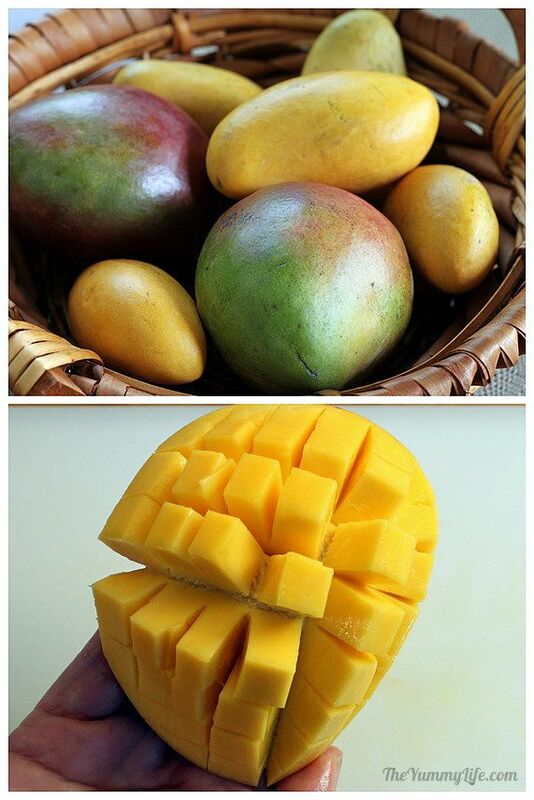 Combine mangoes with other fruit. They are great in a fruit salad. 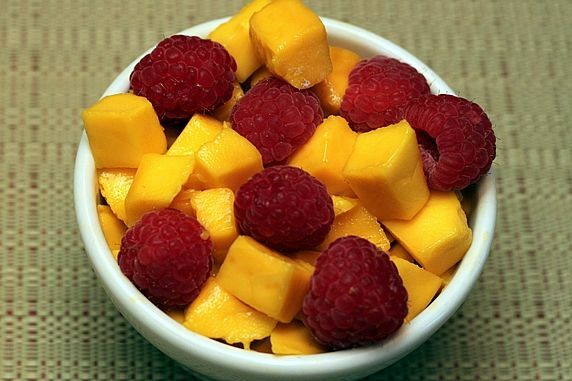 One of my favorite combos is mangoes and raspberries. Their flavors complement each other perfectly. Delish! And, the color contrast is so dang pretty, too. #3. 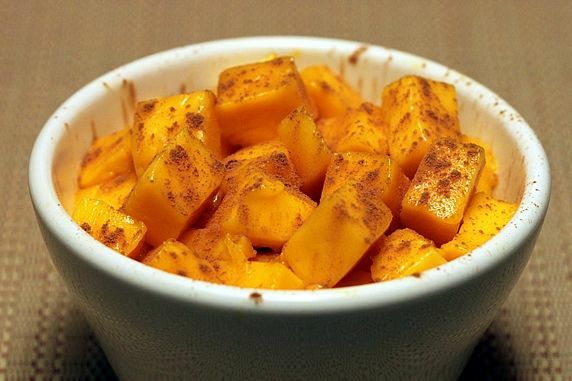 Sprinkle a bowl of mango cubes with cinnamon. Cinnamon is also amazingly good for you (nutrition information here); combine it with mangoes for a powerhouse of flavors and nutrition. #4. 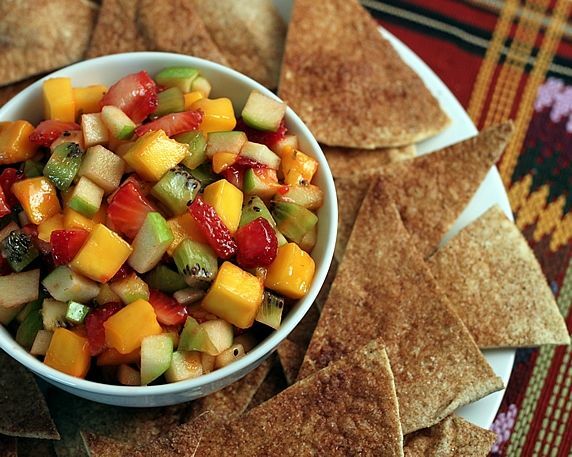 Make Mango Fruit Salad Salsa. I shared this recipe in a previous post. The combo of mangoes, apple, strawberries and kiwi is beautiful and delicious with Sugar and Spice Tortilla Chips. Add mango cubes to cold cereal. 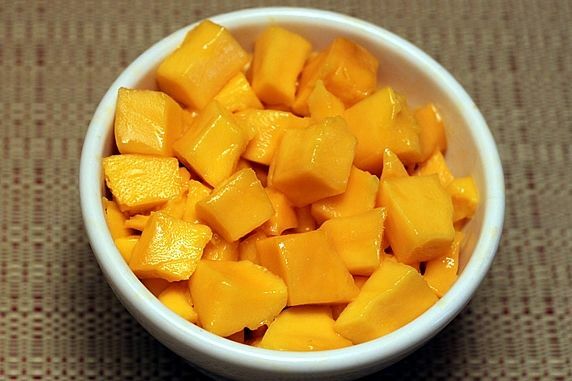 Stir mango cubes into yogurt. Top vanilla ice cream or frozen yogurt with mango cubes. Make a smoothy with mango, vanilla yogurt, and milk. I've tried all of the serving suggestions above. Love them all. 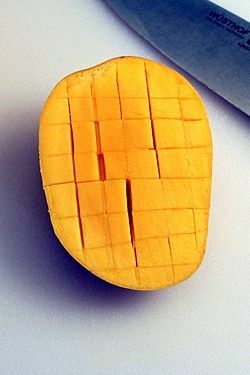 How do you like to eat mangoes?